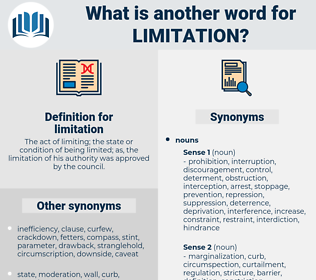 What is another word for limitation? The act of limiting; the state or condition of being limited; as, the limitation of his authority was approved by the council. limiting, cutbacks, demands, pressures, prescription, restricted, reduction, reductions, restricting. 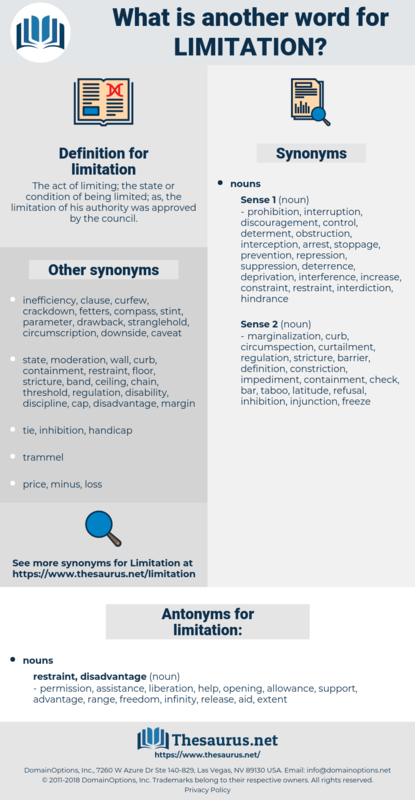 shortcoming, derogation, ceiling, threshold, obstacle, prescription, qualification, encroachment, impediment, time-limit, disadvantage, minimisation, exception, impairment, overload, weakness, barrier, delineation, reduction, imposition, coercion, constraining, reservation, hindrance, Curtailing, restricting, handicap, provision, abridgement, compulsion, shortfall, inconvenience, infringement, retrenchment, deficiency, shortage. limiter, narrowing, demarcation, restraint, enrolment, requirement. permission, assistance, liberation, help, opening, allowance, support, advantage, range, freedom, infinity, release, aid, extent. The program of labor and social legislation included the limitation of the use of the injunction in labor disputes, prohibition of child labor, minimum wage standards for women, the establishment of minimum standards as to health and safety of employees and conditions of labor generally, the creation of a labor department at Washington, and the improvement of country life. The descent from each plane to that next below it means an almost paralysing limitation - a limitation entirely incomprehensible except to those who have experienced the higher possibilities of human consciousness. lineation, line item, loniten, lindane, lenten, lantana, leontodon, land mine, lamentation, lanthanum, lamination, limited edition, london, linden, lunation, lanthanon, landman.